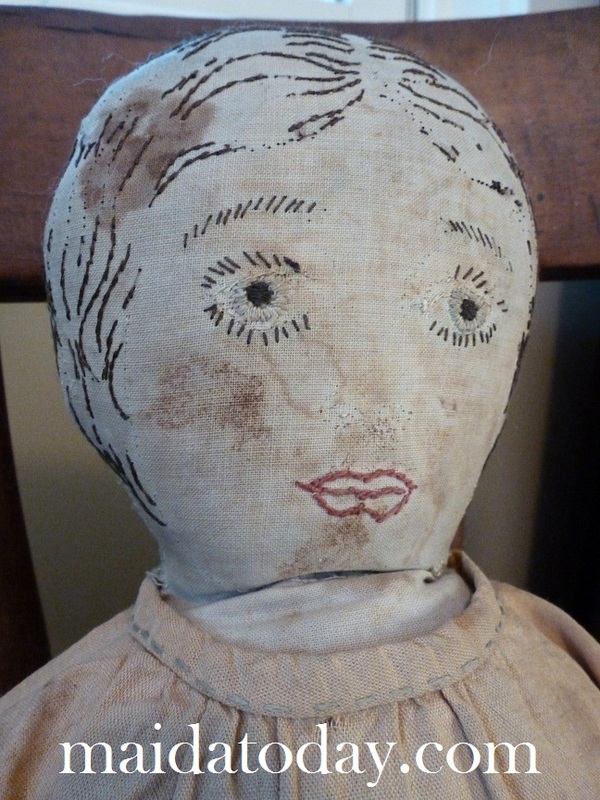 I "accidentally" bought a group of vintage/antique cloth dolls online. ;-) The seller clearly stated they were in tough shape. But I don't mind, because old cloth dolls in tough shape are affordable "teaching dolls" for me. Here is the group as pictured in the online selling venue. 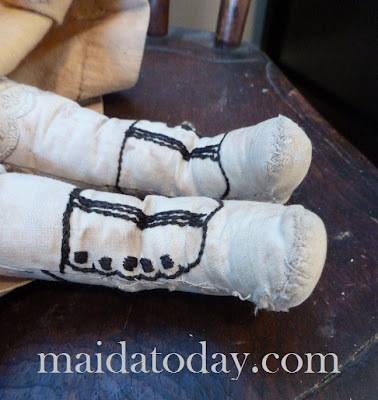 Lithograph printed dolls - litho dolls - were often sold by the yard off the bolt in flat form. 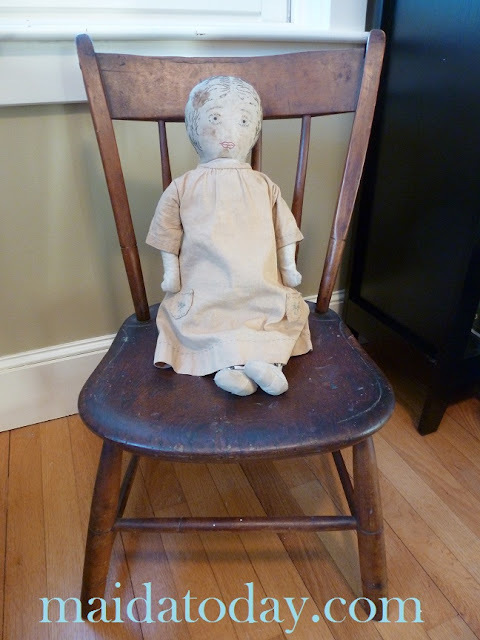 Mama or grandma or the child could stitch up a serviceable plaything quickly and easily. 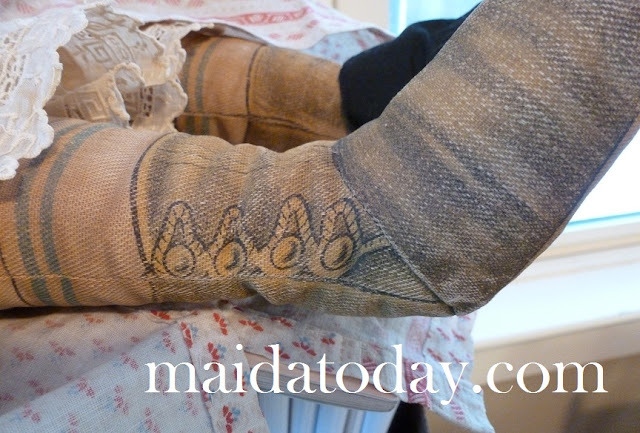 In addition to a lifelike face, clothing or undergarments were frequently part of the printed design. 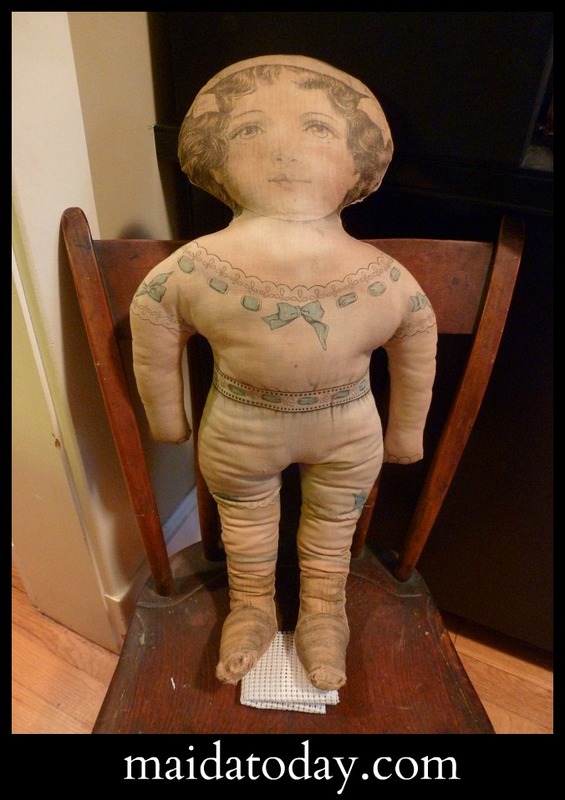 These dolls were most often designed with straight bodies without joints such as this 24" doll below. She has undergarments, stockings and boots printed on the cloth. Her face has a calm demeanor, with a relaxed closed mouth. She has printed folded hands, which are sewn to form a stump shape. Her feet have a seam across the foot which gives them the appearance of a standing foot. so some rug padding was needed to keep her in place. Dressed, possibly in a baby dress? The dress fits her body, but the sleeves and length are a bit long. 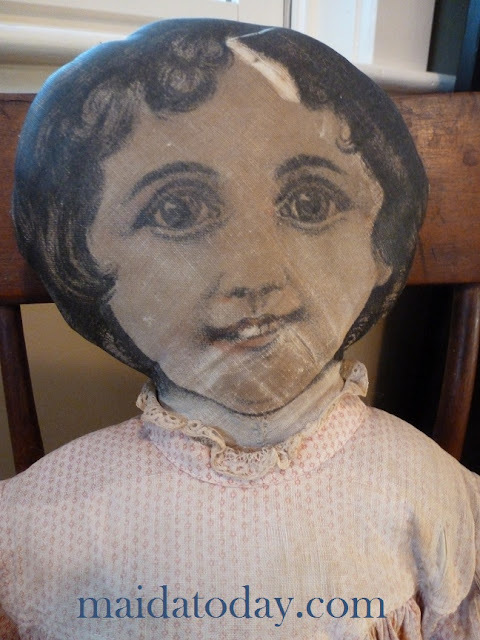 The inked face of the doll below is more lively with an open smiling mouth showing teeth. 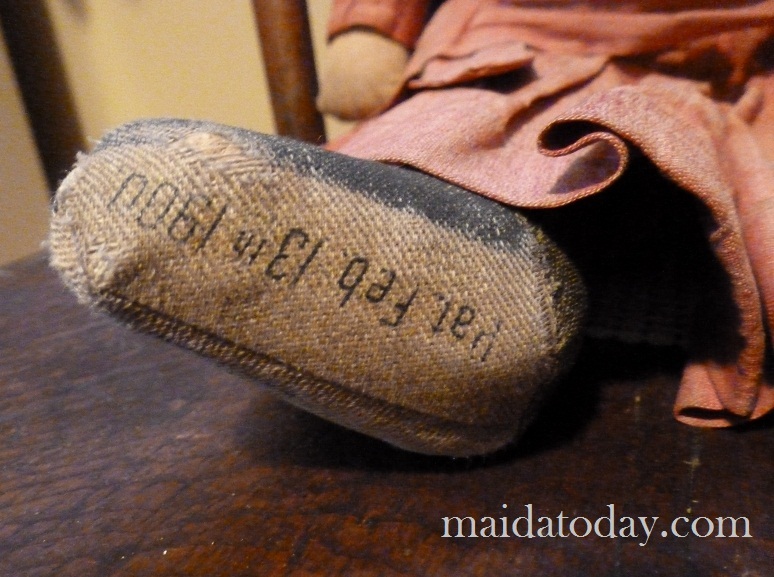 The lines in the printing are less distinct than the doll above. She has a tear in her face, and her feet are worn and coming apart. and wears a vintage dress. Her feet are fraying badly. with the seams coming apart. 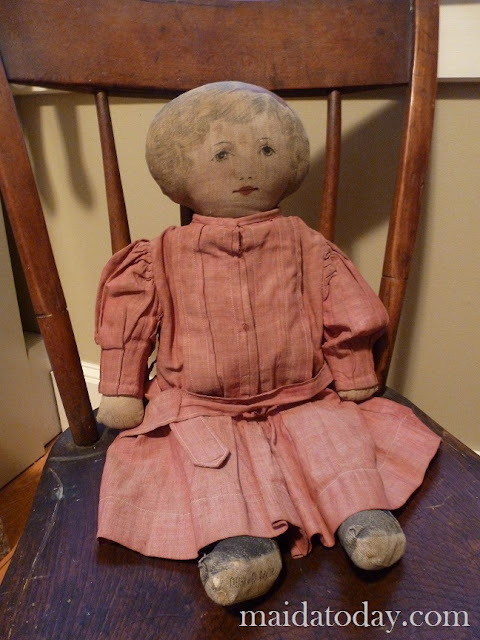 The doll below is one I purchased when I attended a Withington's auction in 2010. While worn at the toes, she wears her own dress reminiscent of a Maggie Bessie doll. Her design was patented February 13, 1900. 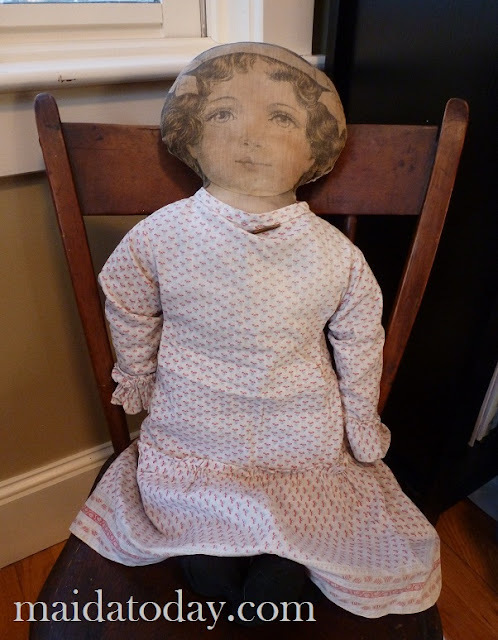 The last doll is an embroidered doll which may or may not have been made with a printed lithographed embroidery design, meant for someone else to finish after sewing the doll together and stuffing her. She has a scalloped lace embroidery to suggest undergarments, as well as embroidered boots. 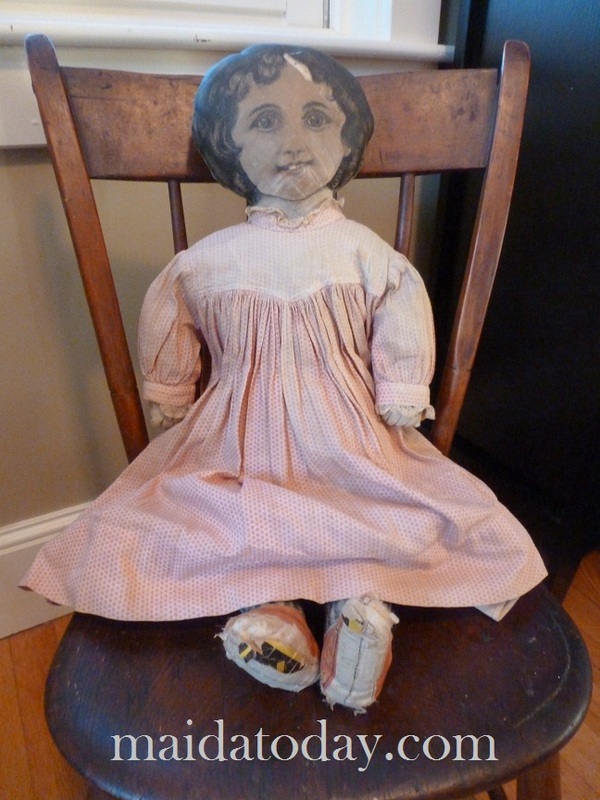 Her hard cotton stuffed and stained body suggests she was a well-loved companion to a child. Her worn face shows the care someone once put into it. 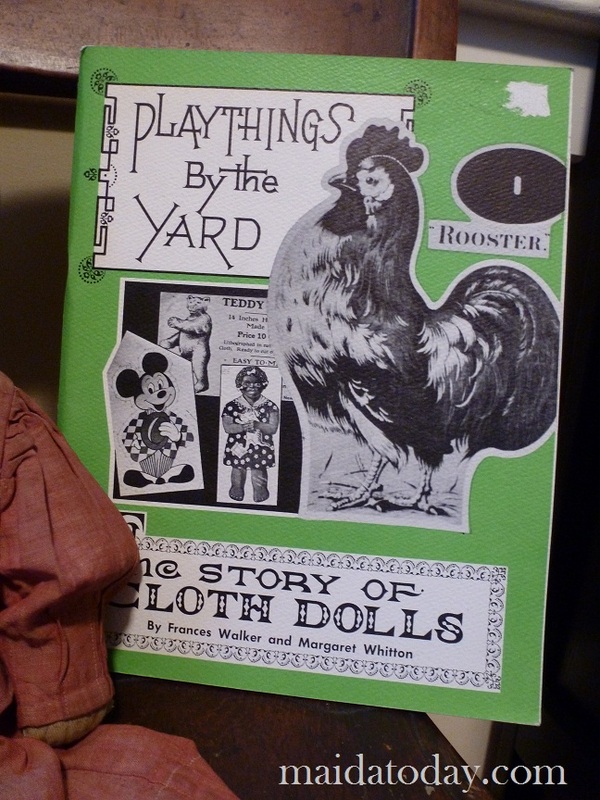 Playthings by the Yard: The Story of Cloth Dolls by Frances Walker and Margaret Whitton is an early black and white resource on litho dolls, published in 1973. 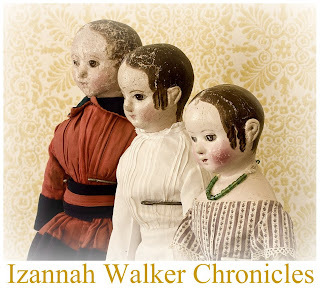 The book gives some information on the history of litho dolls, and has black and white images of many dolls created in the late 19th and early 20th century. Printed cloth dolls continue to made by fabric companies. They are alive and well. 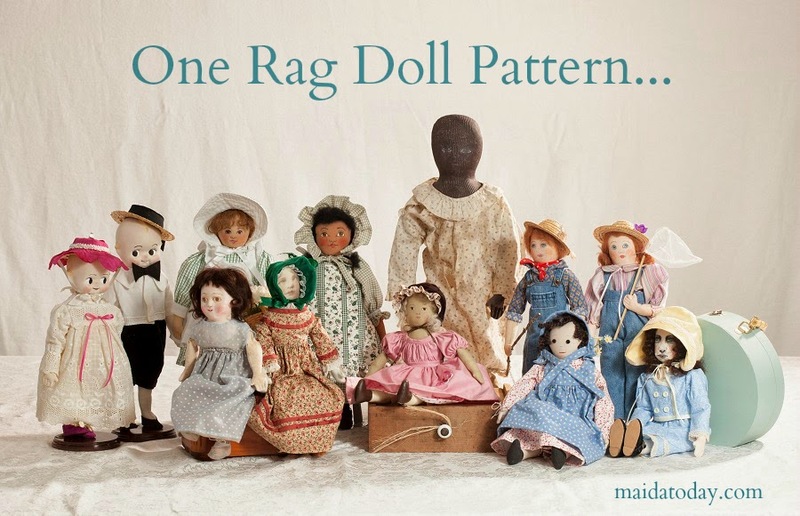 You might want to try your hand designing your own printed cloth doll at Spoonflower. A note about the large watermarks on the pictures. I found content from blogs I write for reproduced at another blog site with words and images in entirety without my permission. In this world of traveling content, it really makes sense to watermark photos. I don't really like to do it so prominently, but that's the reason I'm doing it with a large font. Hello Miss Dixie, I have read your blog for quite awhile & have enjoyed every minute. This post really tugged at my heart--I have always loved these kind of cloth dolls (bears, santas & toys). The video of the printing process was just fascinating!! I never stopped to think how this was done--now I know!! Thanks for all the information you share with all of us doll lovers. Y'know, I used to not really think much about these dolls...but they've so grown on me, and now I see them at dolls shows and appreciate how sweet and down-to-earth they are. These dolls are absolutely precious! You got treasures, the dresses are beautiful too! Thanks for the info on watermarks.